Now look in the hole where the pole used to be and you will see a press in clip, See 1st image below, using a screwdriver, push in the clip and push up and the same time so that you are releasing the inner sleeve, gently pull out the inner sleeve and the direction sensor will come out too, you can then gently pull out the small PCB that has the reed switch on it, NOTE: Be careful when pulling it out as the reed switch and wires are a little delicate. Now its all stripped down and ready for the wire with the bulbs attached. 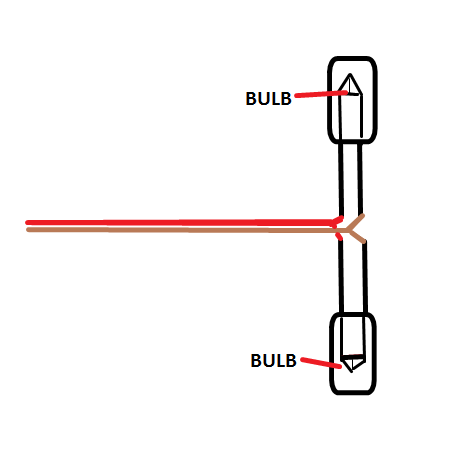 You really need to attach the bulbs to the wire as shown in image 3 below, the reason for this is so that you can have one bulb at the very bottom of the housing and one behind the small PCB. At this point you can insulate the back of the PCB where the bulb will go and the wires for the direction sensor as shown in image 2. It will be easier to route the wires by removing the screw that's in image 1 below and gently pulling the pipe out, Now you need the thread the wire into the housing and out through the SAME hole the flat 6 care cable is through, then through the pipe, pull it all through so your left with just the bulbs as shown in the 2nd image below (used thicker wire to show you), Now carefully refit the PCB holder holding the wires out of the way, make sure it goes all the way to the bottom else the other sleeve will not click into place. Now carefully push one bulb OVER the PCB and down to the bottom of the housing to the metal plate that holds the speed sensor bearing, then push the other bulb behind the PCB and pulling any spare cable through the hole so there is NO spare cable inside the housing at all. see image 3, you can see the bulb behind the PCB but the 1st bulb is now hidden. You can now fit the pole back in to the anemometer hosing now, again, its imperative that you DO NOT pinch the wires and make sure the holes line up and that there's a clear line of sight for the screw to be fitted without harming the wires inside, if there is not clear line of sight then pull it off again and refit it until your happy the screw will not damage the wires. If you haven't already done so, remove all screws again so you can lift up the PCB that's in image 1, now remove the melted glue from the hole where the flat 6 core wire comes through and thread your new wire following the path of the flat 6 core cable, making sure its under the big o-ring and all the way out of the housing, its this part that will let you know if your wire is thin enough. Make sure you leave about 8 inches of slack wire inside the pipe just in case you need to do any maintenance on the other end in the future, if you don't you will not be able to pull the other end apart without disassembling this section again. If your happy with it all then lightly coat the o-ring with Vaseline/Petroleum jelly, do the same with the rubber water stop you pulled out earlier, this is to help repel any water/moisture, then gently screw down the PCB, and the 2 wire stops and refit the case cover, any screws left over? no doubt pmsl... That's about it, refit the temperature switch and use a water proof housing for it, you can extend the temperature probe by a MAXIMUM of 1 meter so the switch unit will need to be close to the anemometer, I would also seal the probe, I'm sure it says to do that anyway, just follow the instructions that comes with the switch and you wont go far wrong. When wiring up the switch (its normally open) you have to wire it up so its now normally closed, the reason for this is because in normal use the switch is used for setting off the relay once it reaches ahigher temperature, but we want it to activate once it reaches around 2oC (lower temp) so you must wire it so its normally closed, now the odd part. When used in the normally open way, the switch activates the relay and the LED on the switch comes on to let you know its switched, well because of the need to wire it normally closed, the LED is permanently on until it switches then it turns off, i think it was an oversight at the manufacturing stage but it took me around a day to figure out it still works as needed using the fridge!